This week is STAAR testing week for the state of Texas. AKA the most stressful week of the whole school year. It's the week that teachers from grades 3-8 can tell if their students have been listening for the last 8 months. And lemme tell you.....I don't think the majority of my students were listening at all. Now obviously that's a joke (kinda sorta) but seriously sometimes I wonder if these kids of mine have ears and brains in general. Keep in mind these are 13/14 (in some case 15) year olds who are going through about 1000 different emotions every day. Which I can totally relate to because you know I was an 8th grader once too. But it can get real rough in my class listening/talking to my kiddos. 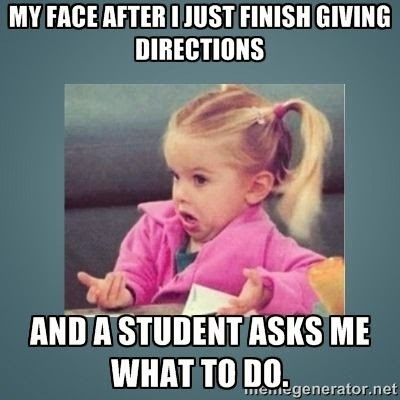 Allow me to demonstrate some of the frustrations and thoughts we teachers go through via some very funny memes. All day everyday with that one. You would not believe how often this happens. Some of my 8th graders have the attention span of a......monkey? Sometimes I'm pretty sure they ask me a question just to get me off topic which happens pretty often. The kids don't hate it. 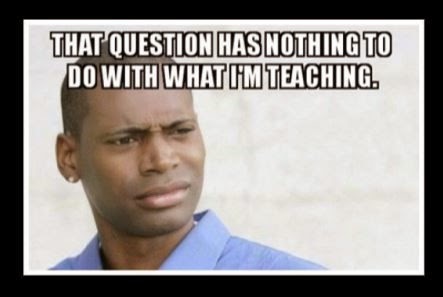 If this isn't my answer, I'll have 5 different student asking me to leave the classroom. I don't have time for that. 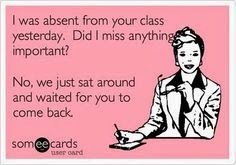 That is when my students remember to ask me what they missed. Which they never do. 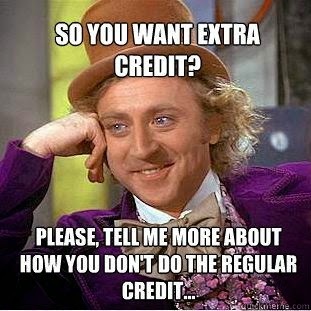 And then they want to know why they have a bad grade. "Ms. why did you give me that grade." Ummmm....did you study for test? No? Oh ok tell me again how I "gave" you that grade. Yeah, you earned that grade. Of course I know what you're doing!!!!! I used to be you and did the exact same thing. In fact I did it at the faculty meeting last week. So yeah I know when you're on your phone. Plus no one just looks at their crotch and smiles. No one. 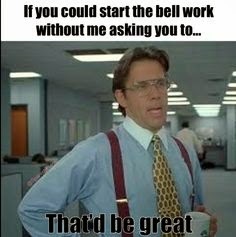 Since the beginning of the year we've had bell work. Everyday I have to remind them that they should be doing said bell work when they come into my room. You'd think they'd have figured it out by now....but they haven't. 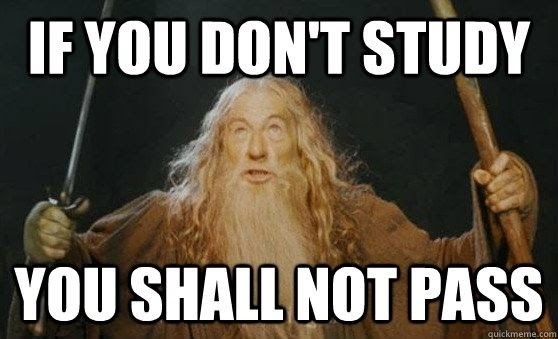 Story of my life this year. 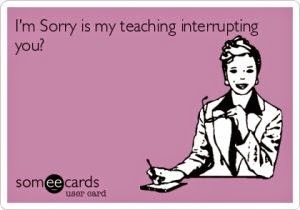 I refuse to talk over my students. 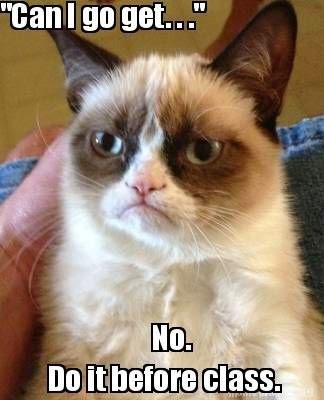 If the whole room isn't silent then I stand there with the "Grumpy Cat" look on my face until they are quite. I'm surprised my face hasn't frozen into that look yet. It's fine I'll wait. I'm on your time not my time after all. This one is my personal favorite. Give you extra work is giving me extra work. How about we stick to doing the regular work so neither of us have extra work. K thanks. Lots of teachers hang the memes I've shared in their classrooms. Which I think is a fantastic idea if only to bring little humor into the room. And that's what I'm trying to bring into this post. A little humor to some very real thoughts that I guarantee all teachers feel. 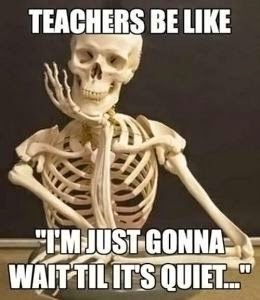 Am I right my fellow teachers? Yep, I'm right! Now I'm off to watch my students take a test that I'm not allowed to help them on nor am I allowed to do anything but walk around the room and make sure no one is cheating or talking.......for about 6 hours straight. It's literally the worst thing ever. Oh STAAR test, I do not miss you. When my kids would complain that it was boring I would always say "really? 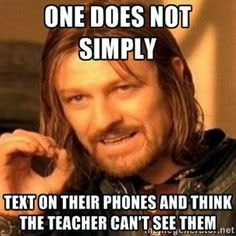 Because I am watching you take a test. At least YOU have something to read." I hope you poured yourself a large adult beverage at the end of the day.